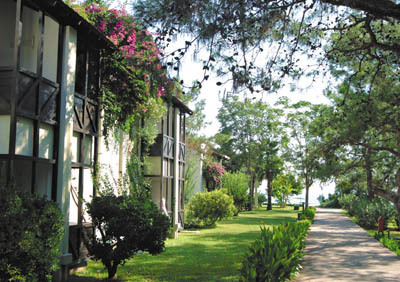 The widespread, extensive holiday resort is located at the beach, in the midst of a large park with pine trees, beautiful lawns. 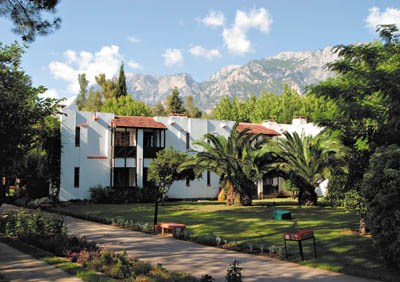 The impressive Taurus mountains form a beautiful scenery. 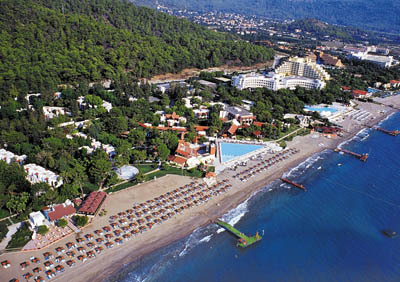 The club is 6 km away from resort center Kemer, 2 km from Goynuk. Reception * lobby * restaurant with non-smoking area * a la carte restaurant bars * Turkish café * disco * kids club (4-12 age) * outdoor swimming pool * kids pool. Tennis courts, table tennis, darts, mini football, basketball, aerobic, beach volleyball, fitness, canoe. Imported drinks, champagne, Turkish coffee, fresh fruit juices, tennis lessons and equipment, billiards, atari games, internet, water sports, massage, sauna Turkish bath. Air-conditioning (central) * balcony * minibar * satellite TV * bathroom with hairdryer * telephone * safe box (payable locally). Situated directly on the beach. The extensive gravel and stone beach with a cliffy seashore has got 3 foot bridges leading into the sea. It is recommended to wear bathing shoes. 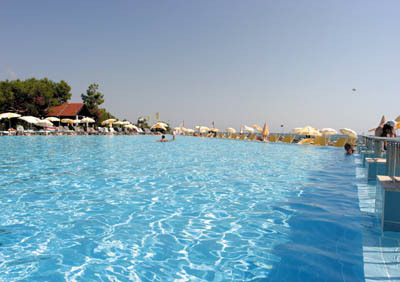 Sunshades, deckchairs and towels are free of charge as well at the beachside as at the poolside. Unlimited soft and alcoholic local drinks between 10.00-03.00. Open buffet breakfast, lunch & dinner. Late dinner, snack time, tea time, midnight snack.